The Global Volcanism Program has no activity reports for Chachimbiro. The Global Volcanism Program has no Weekly Reports available for Chachimbiro. The Global Volcanism Program has no Bulletin Reports available for Chachimbiro. The Chachimbiro volcanic complex lies about 25 km NW of the city of Ibarra. Late Pleistocene collapse of the andesitic Huanguillaro stratovolcano produced a 6.8 km3 debris-avalanche deposit and a 4-km-wide avalanche caldera open to the east that has largely been filled by lava domes, including the rhyodacitic Hugá lava dome. The avalanche deposit is overlain by three large ignimbrites and pyroclastic-flow deposits related to dome growth. The late Pleistocene-to-Holocene, NNE-trending dacitic Chachimbiro-Pucará line of lava domes includes the Pitzantzi lava dome, which erupted about 5700 years ago, producing an ash deposit that extends to the NW. Hot springs and thermal areas are present in the complex. Beate B, 1990. Sequence of explosive products of the Chachimbiro volcanic complex, Ecuador, South America. IAVCEI 1990 Internatl Volc Cong, Mainz, Abs, (unpaginated). There is no Deformation History data available for Chachimbiro. There is no Emissions History data available for Chachimbiro. Part of the Chachimbiro volcanic complex, located about 25 km NW of the city of Ibarra, is seen from the south. The late Pleistocene-to-Holocene, NNE-trending dacitic Chachimbiro-Pucará line of lava domes includes the Pitzantzi lava dome, which erupted about 5700 years ago, producing an ash deposit that extends to the NW. Hot springs and thermal areas are present at the Chachimbiro complex. 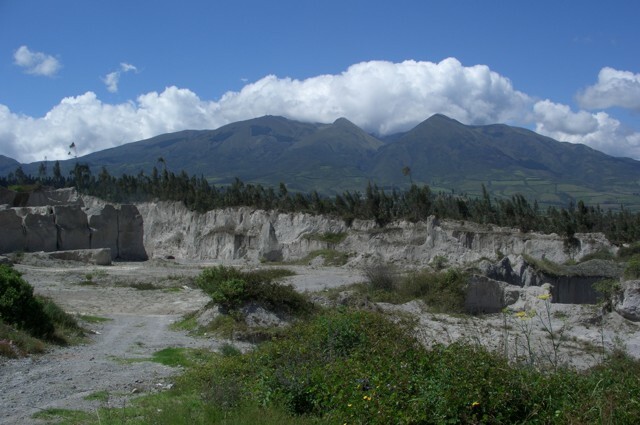 Quarries in the foreground are cut into deposits from the caldera-forming eruption of Cuicocha volcano. There are no samples for Chachimbiro in the Smithsonian's NMNH Department of Mineral Sciences Rock and Ore collection. Large Eruptions of Chachimbiro Information about large Quaternary eruptions (VEI >= 4) is cataloged in the Large Magnitude Explosive Volcanic Eruptions (LaMEVE) database of the Volcano Global Risk Identification and Analysis Project (VOGRIPA).